There is SO much happening in hives this time of year. Colonies are expanding, and the weather has allowed for massive nectar (soon to be honey?) collection. We’ve been busy mentoring newbees, and taking calls and answering texts about similar issues. Hopefully your colony is booming. Here are some amazing statistics to consider. According to Dr. Larry Connor, who spoke at to Kalamazoo Bee Club last week, a full deep frame of bees yields 5,000 – 6,000 bees. A vibrant queen in a thriving hive will lay a frame every 2-3 days. 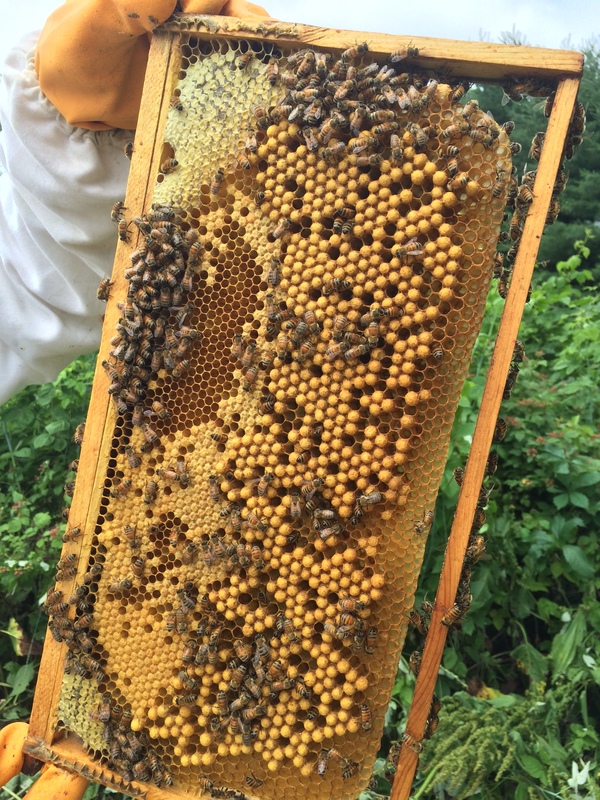 The package you installed contained only about 10,000–so as that queen reaches her peak laying, the hive’s growth is exponential (and awesome!) t is a fun time of year with colonies expanding so rapidly. It means swarms, lots of nectar gathering, queen cells, and splits to be made to increase the number of hives. Love this queen! A bee-to-be in practically every cell. Where there isn’t the brown flat cap of worker brood, there’s typically a larva, or honey, or pollen. 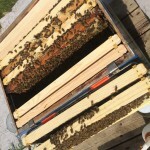 If you have bees actively working most of the frames in a box, or they have worked them already (meaning they may already be filled up with honey—which appears clear until it is capped), put on a second box. Or a third box. Yes, there are new colonies that are already in three boxes. Ventilation: By now, night temperatures are fairly stable and mainly in the sixties, and most colonies are large enough to keep brood warm. If you have screened bottom boards, remove the slider boards entirely or open up substantially, unless it is a small, struggling colony. Your entrance reducer should be opened up to larger sizes (or removed entirely) as your colony grows. Consider an upper entrance in each upper box. We drill a half-inch hole on the face of the hive body, typically aligned roughly with the handhold. This allows for airflow and easy access to the honey vault when foragers bring in nectar. It also helps cure the nectar into honey faster, and bees seem to love the upper entrances as their homes grow taller. That entrance will be essential for wintering, so might as well get it in now when it is also helpful. Feeding: We’re still feeding any new colony that will take it. Some do, some don’t. And for those that do, they’ll get it as long as they’re interested. Pollen patties: We’re routinely working 30+ colonies, and none of them seem interested. Plenty of fresh stuff available. However – if yours are eating it, that’s grand. But if not, get it out. It attracts small hive beetles and other nefarious critters. 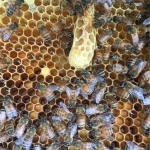 Queen cells: When a hive is thinking of swarming (too crowded) or superceding the queen (something is not quite right with her they sense) they’ll build queen cells. There are many opinions and options about what to do about with them when you find them. If you chose to do nothing, note in your bee log when you saw them (or it) and their color. A carmel-colored cell is nearing hatching, and your colony will not have an active queen for a bit. You’ll need to keep an eye on it to ensure a queen comes back online. Contact me for more information if you find queen cells. How we handle them depends on a multitude of factors. 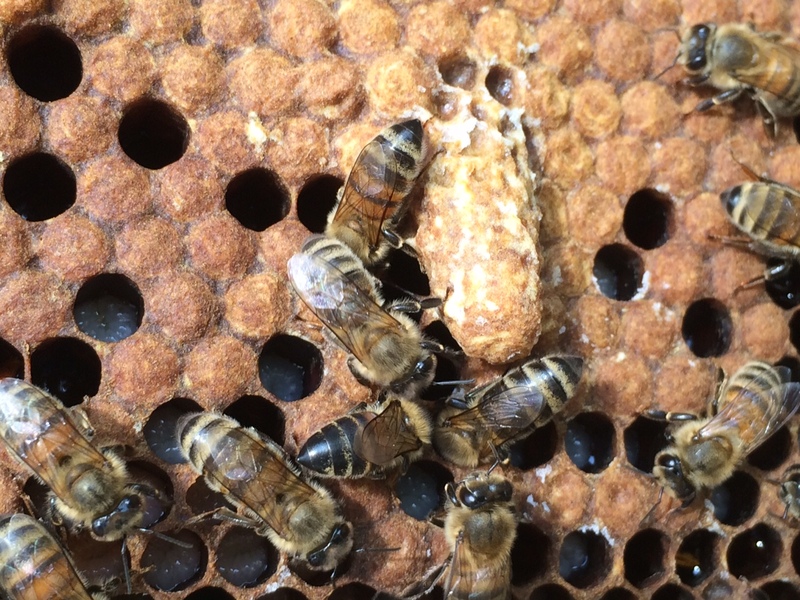 This queen cell is capped (the bottom is covered), but is younger than the other. 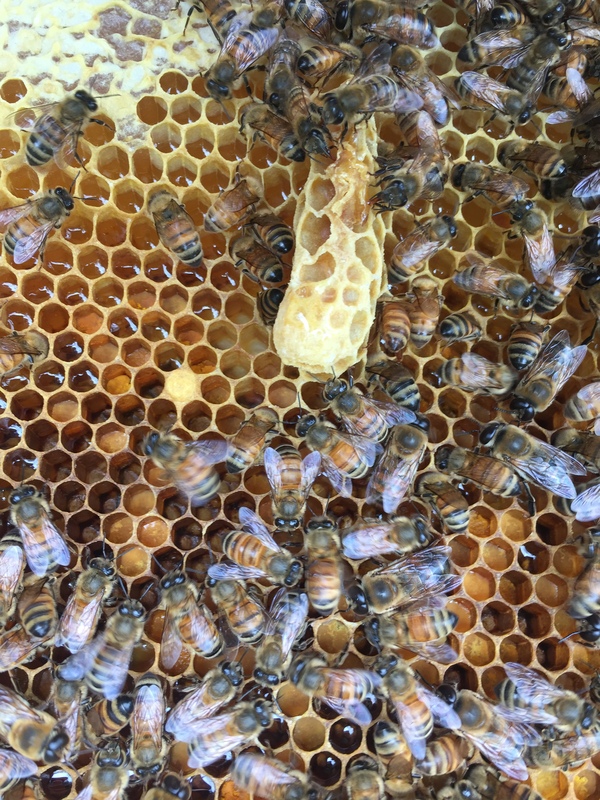 A capped queen cell, surrounded by capped worker bee cells, and loving attendants. This one should be hatching within a few days as it is dark in color. You love your bees: Yes, that’s quite common and quite normal. I recently received this note from a fairly new beekeeper “Whenever I pull a frame out (and it’s not like I’ve done very many) I have to really focus on what I’m supposed to be looking for, because it is all so fascinating to me, and I just want to watch them crawling around…” Folks, I have the same concern, and I’ve been keeping bees since 2008. What’s too often to check bees? We are in each of ours every two weeks, and more often if there are issues (like we knew they were making a new queen, we want to ensure she mated and is laying well.) Sometimes we’re in colonies weekly. More frequently than that is leaning toward too much; the disruption slows them down. However, you need to learn, so you have to examine your colony to figure out what’s going on. What should my colony’s progress look like? Well, that depends on so many things that’s hard to answer. 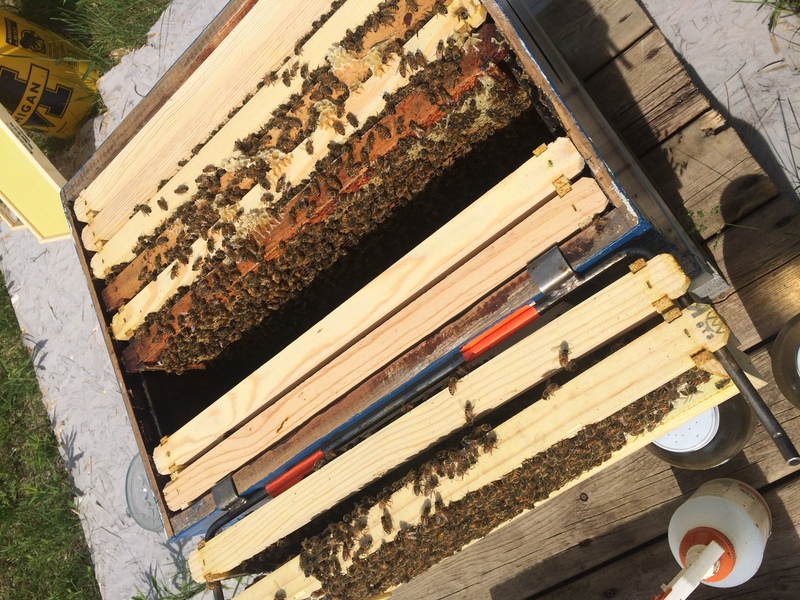 Folks were getting packages and nucs as early as early April through last weekend; the early started colonies had weather challenges, but are on their second or third round of brood build-up. With such disparity on when colonies started, there is no good benchmark for what to expect to see in your hive this time of year. My friend Z installed a package on May 2. The next two pictures provide a peek at where his bees were at last week. I consider this frame being actively worked by bees. Not only are there plenty of bees on it, but they’ve already added wax to over half the cell prints on the plastic foundation. Is the colony queenright? Queenright means the colony has a queen, and she’s doing what she’s supposed to be doing. A queenright colony will be generally pleasant in demeanor, and steadily growing. What’s the queen supposed to be doing? Laying one egg per cell, with the vast majority of the cells containing worker bees-to-be, not drones. Telling future drones from future worker bees is easy by looking at capped brood. Worker brood is flat; drone brood is bumpy and irregular. The queen should also be laying an egg in almost every cell, with an increasingly growing number of cells in the nursery. She won’t outlay her workforce, so packages start slowly, but grow exponentially after bees begin hatching. It takes a while for momentum to get going. Add the next box when bees are actively working about 70% of the frames. A common mistake we’re seeing is people adding the second box within a month of installing their package bees. Remember, worker bees take 21 days to hatch. A package queen might take a week or so after installation before she starts laying, so the earliest the package’s population will increase is over three weeks from installation … and during those first three weeks, bees are naturally dying. Don’t give a package more room than they can patrol and regulate. We’ve seem some absolutely booming nucs. 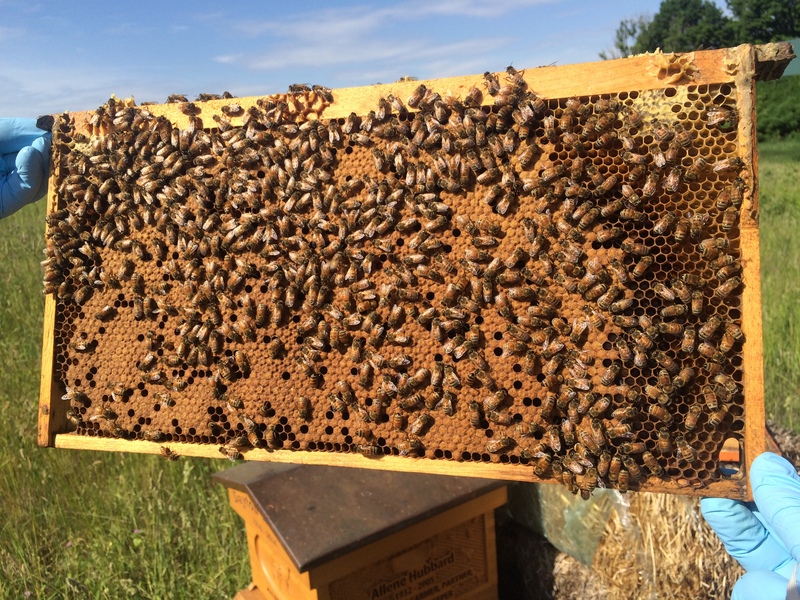 A nuc comes with a laying queen and brood already underway, so make sure you stay ahead of them by adding boxes appropriately. There’s lots going on in your colony this time of year. If it isn’t booming, or if you aren’t sure, feel free to contact me so we can try and figure it out. The world needs bees, and beekeepers. I am a newbee near Centreville. 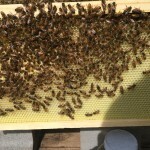 Approx 6 weeks ago I installed 2 nucs into new supers with wax covered frames. About 10 days ago added 2nd super. One hive is much stronger than the other. Sunday I added a smaller super to the strongest hive. Sunday morning my husband was in our farm/garden and saw a swarm. I checked my strongest hive – each frame and do not see a queen.I have never seen one but know they are large. 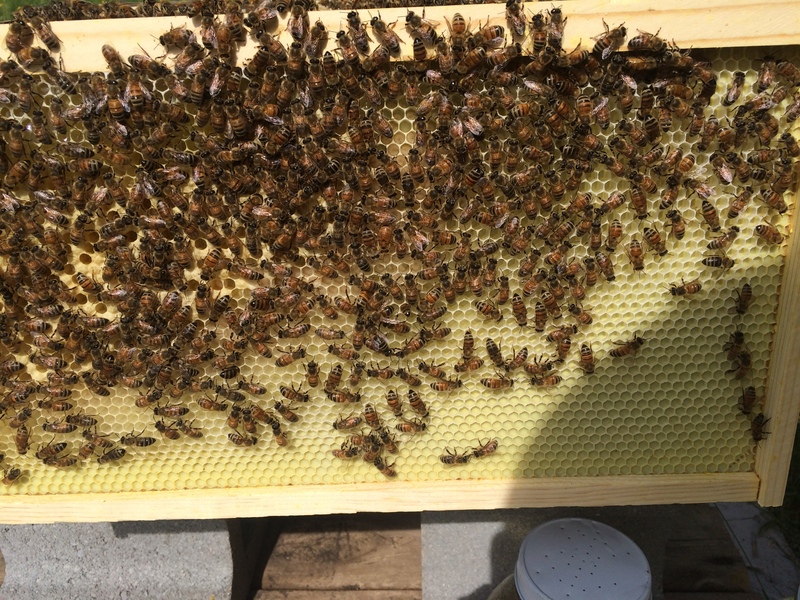 There are alot of what I believe to be queen cells and all frames are teeming with bees. I do not know if the swarm was from my hive. Should I be concerned that I did not see the queen? and should I leave the queen cells alone? Be EVER SO CAREFUL being in that hive so you don’t damage the queen cells. That’s the future of the colony. They might also be a bit cranky as they’re not queenright. (Assuming it was them.) Did you notice eggs or small larva? Usually they run the queen around a few days to thin her down before swarming, so if you saw eggs or small larva, she’s still there likely. Larger or no larva would tell me she’s gone. If there were multiple queen cells on different frames, I’d be really tempted to make a nuc from that strong colony. Lemme know if that’s the case and if you’d like to talk thru it. Watch that presumably swarmed hive. Assuming the new queen hatches — today let’s say. Ten days from now you should see eggs / maybe larva. If not, I’d put a frame of young brood (eggs and / or little tiny larva) from another hive in there. That does several things: (1) open worker brood shuts down the ovaries of worker bees, keeping laying worker bees from developing and (2) if there isn’t a queen coming up to speed, they’ll draw some of those young eggs / larva into queen cells — telling you they need a queen and (3) if they don’t make queen cells, you’ve got a frame of brood to supplement the work force. 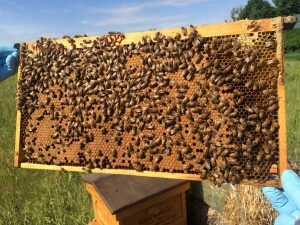 You’re going to have a break in the brood cycle if she swarmed — 10 days between laying queens, and no new bees coming out until 21 days after new queen starts laying. That’s helpful for varroa control, but will mean a hit in the workforce so a frame of open brood will help ensure their success.